FROM CORNWALL WITH LOVE HAMPER. 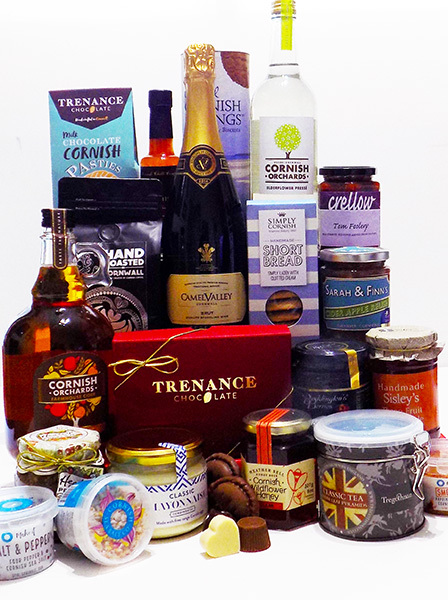 This super Cornish Hamper is bursting with all the very best Cornwall has to offer! Perfectly balanced sweet and savoury flavours, a little extravagance,plus delicious delights for every day! From Cornwall With Love Hamper is carefully packed in a beautiful red hamper gift box and hand decorated with swirls of golden ribbon. Includes your message on a hand written Cornish themed Greetings Card. A fantastic Cornish Hamper that creates an impact inside and out!All sourced within 20 miles of the Cornish Store Falmouth.